One of my goals has been to create a self-sustaining portfolio. My definition of self-sustaining portfolio is one in which new capital comes from the portfolio itself and not from our income. Such a portfolio could continue to provide a passive income perpetually and would be very useful during retirement. My quest is of course to achieve this even before retirement. Could I create a self-sustaining portfolio before reaching 60? The answer to the above question is YES! Let’s say we start at 22 by contributing $12,000 to our portfolio. Assuming a conservative ROI of 5% (It’s 2.0% more than the yield of Vanguard High Yield Index Fund) the portfolio becomes self-sustaining at 42. So, it takes 20 years to become self-sustaining. This is good if I had started at 22. I am presently 36. I would still love having a self-sustaining portfolio by 56. The only problem is it won’t have enough time to grow. This is unfortunate. However, the way to compensate would be to increase my contributions drastically. The portfolio mentioned above would be self-sustaining at 42 and would continue to grow. 42 is the first year a full contribution i.e. $12,000 comes exclusively from the portfolio itself. By age 50 this portfolio would be worth $372,000 and at 60 $606,000. 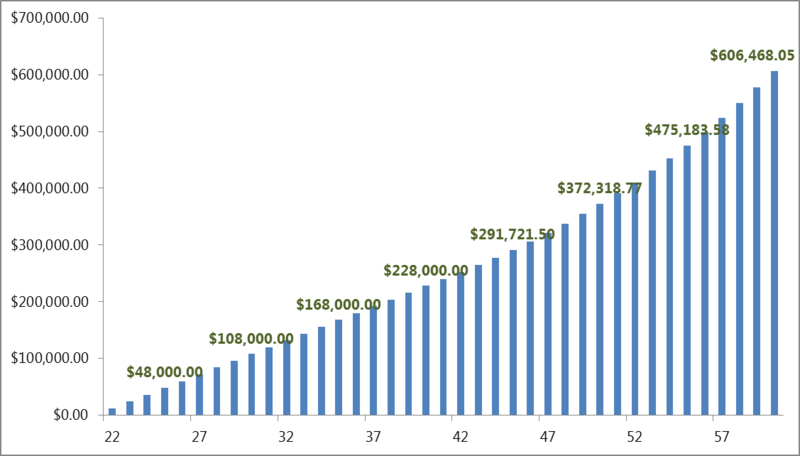 Assuming a 4% withdrawal rate, this portfolio can generate $24,258.72 yearly in income. How much did we have to invest to get the $24,258.72 in yearly income? Only 20.78% of the portfolio is from actual investment. 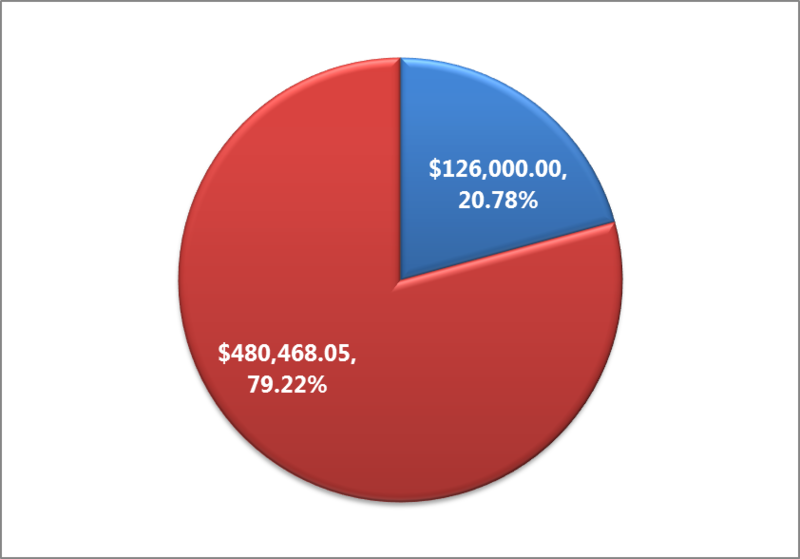 The remaining 79.22% is from the compounding in portfolio. The final question I had is can I reduce the duration by increasing ROI? 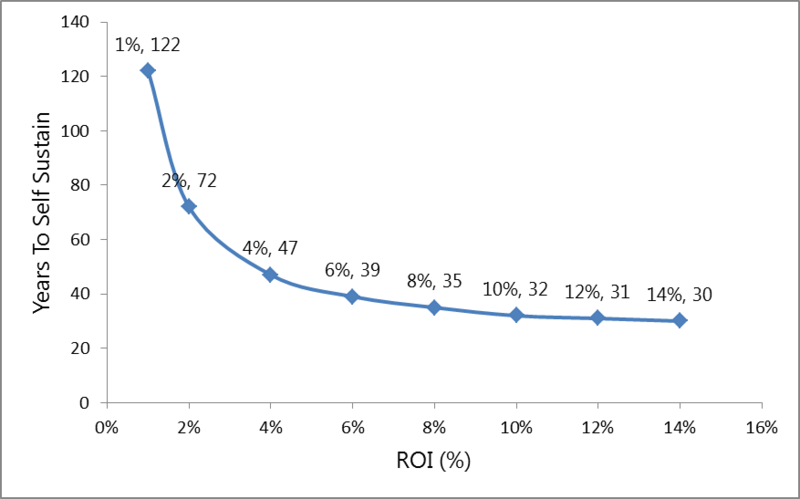 The effectiveness of ROI decreases with increase in ROI. The reason is because compounding is exponential and as such would flatten asymptotically. At 1% it would take 122 years to become self-sustaining :). However, between 10%, 12% and 14% there is really no difference. 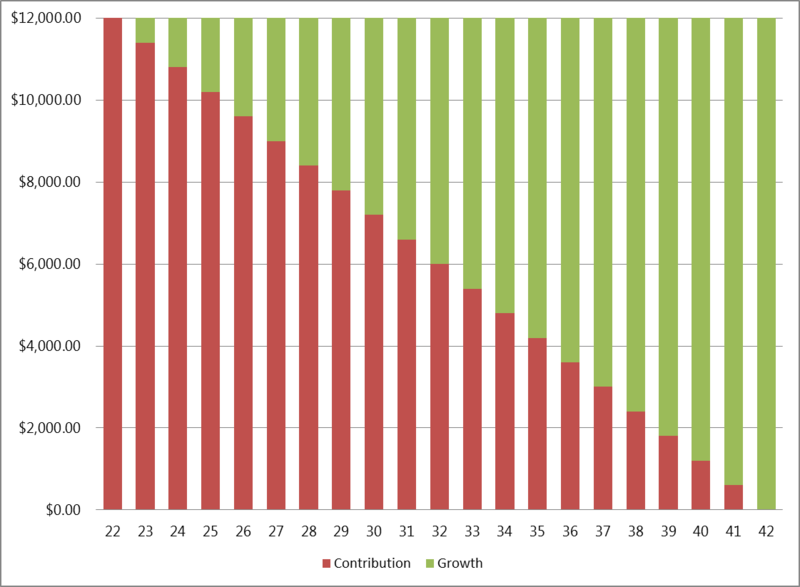 This should be quite obvious if you have read my analysis on Effect of savings, investment return and time on retirement. Although I have not started investing early in my age I still see a way forward. I am hoping to have a self-sustaining portfolio by 56. If I get a better ROI & invest more capital I could reach it earlier. I am hoping to create my self-sustaining portfolio by 50. You can do it. Getting the capital and contributing more, you got this, don't hold yourself back, LETS GO! Hey DG. As I was reading this I was thinking about inflation. I don't think you mentioned it, but since you used a conservative ROI of 5% I think you can still make it happen. If we assume a 2%-3% inflation rate, you'd have to change your ROI to 7%-8%, but that's not unrealistic to achieve. Then your dollar amounts in the future would reflect purchasing power in today's dollars. Thoughts? You may have started a little later than desired, but time is still on your side. Go get it by 50! Hey DivGeek, I'm sure if you really want it, you can get that self-sustaining portfolio by 50. But in the meantime, just make sure you're doing what's important to you - life's too short to wait until you're portfolio's big enough, even if that happens before 50!